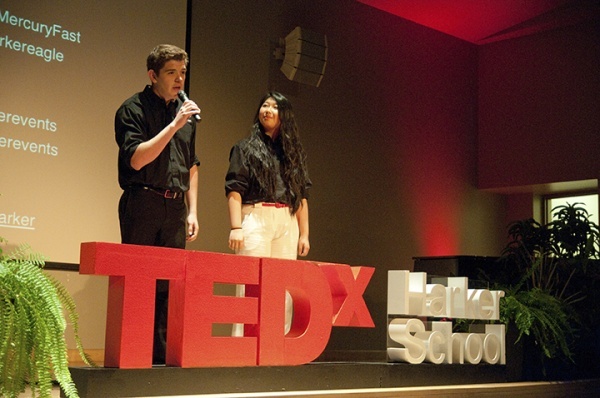 The latest installment of TEDxHarkerSchool was held March 22 at the upper school campus. Launched in fall 2011, the student-organized series of events gives high school students interested in entrepreneurship the chance to hear inspiring speakers and meet with mentors from many different fields. Organizers put together another impressive lineup of speakers for this year’s event. Among them was Harker student Arjun Mehta, grade 12, who has received much attention for his most recent endeavor, a conferencing app known as Stoodle, which already boasts thousands of users since its launch in December 2012. With the assistance of his father, Karl, Mehta’s previous business idea grew into PlaySpan, which sold for $200 million. Mehta detailed what he believed were key steps for young entrepreneurs. He advised students to look for “pain points” in their everyday lives, seeking solutions to problems they regularly encounter. In response to the differences he noticed between Harker and his previous school, Mehta founded Stoodle to help give students at other schools a chance to collaborate and share their knowledge with one another. Mehta also encouraged future entrepreneurs to work in familiar spaces. Because Mehta was a high school student, he and his Stoodle collaborators were treated as “experts in the room” when meeting with older, more experienced entrepreneurs. Mehta also offered advice on how to reconcile the busy life of a young entrepreneur with the obligations of a high school student. He cited a “willingness to be misunderstood” due to not having as much time for friends and extracurricular activities. During the Q&A session that followed his talk, Mehta demonstrated his 30-second elevator pitch to the audience. He added that he plans to continue working on Stoodle while in college and keep it free to all. A morning break allowed students to converse with the speakers and mentors in attendance. Students also got the chance to sit down with various entrepreneurs during lunch, gaining knowledge and sharing ideas. “I find the mentor luncheon to be the most unique aspect of TEDxHarkerSchool, as it gives attendees an opportunity to interact with professionals on a more personal level,” said Glenn Reddy, grade 11, who helped organize and run the event. New this year, various companies showed their products in the Nichols Hall atrium. This year’s exhibitors were GoPro, Master Images, Stoodle, Fuhu and Lighting for Literacy. “The attendees jumped at the chance to check out the booths in the atrium, and they were one of the most popular parts of the day,” Reddy said. One of the more popular afternoon speakers was Dr. Ronda Beaman, chief creative officer at PEAK Learning and clinical professor at Cal Poly’s Orfalea College of Business. Known for her infectious speaking style and stage presence, Beaman started her talk by leading the audience in the Hokey Pokey. Beaman told the audience about the importance of neoteny, which is the ability for people to keep their “childlike qualities” – such as curiosity, creativity and an inclination toward experimentation – through their adult lives. The “neotenous mind” is what allows for the creative entrepreneurship that leads to exciting ideas such as phones that converse with their owners, and microfinance organizations such as Kiva, she said.